Creating a support ticket via Support Center allows customers to keep track of the status of the ticket and also to manage the history of tickets raised by customers or their colleagues in one place. 1. Visit the support portal dedicated to your account (http://domainname.happyfox.com) for example https://support.happyfox.com . 2. Click on Create a new ticket/Submit Ticket todisplay the ticket form. 3. Fill out the form and mention all the details related to the issue and attach files if required. 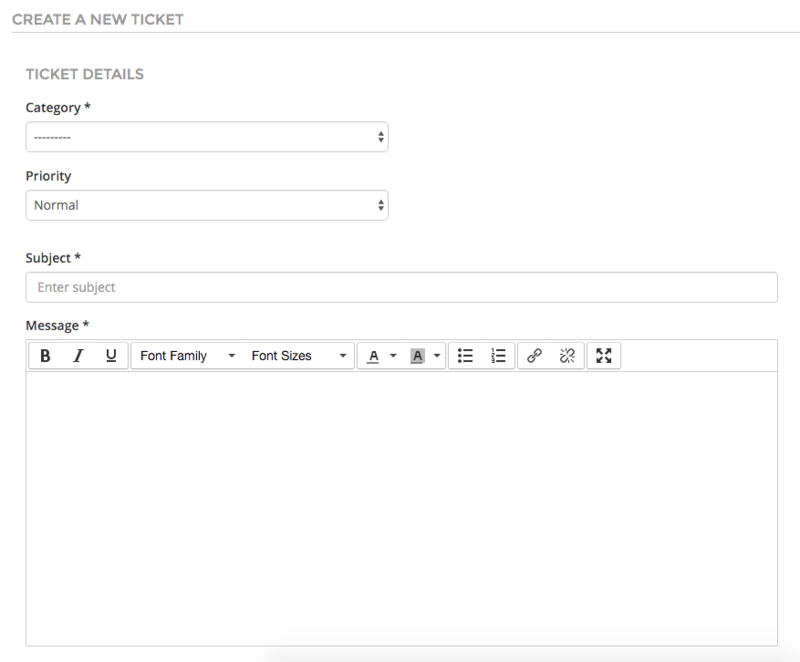 The fields that appear on the ticket form can be configured under Manage -> General -> New Ticket Form Customization Options. Every HappyFox support account comes with a set of default mandatory fields (Category, Subject, Message, email) that are important for the functioning of your helpdesk. These fields are a part of every ticket in your helpdesk, and will be used by the agents extensively as they try to resolve issues. For this purpose, default fields cannot be removed from your ticket form. 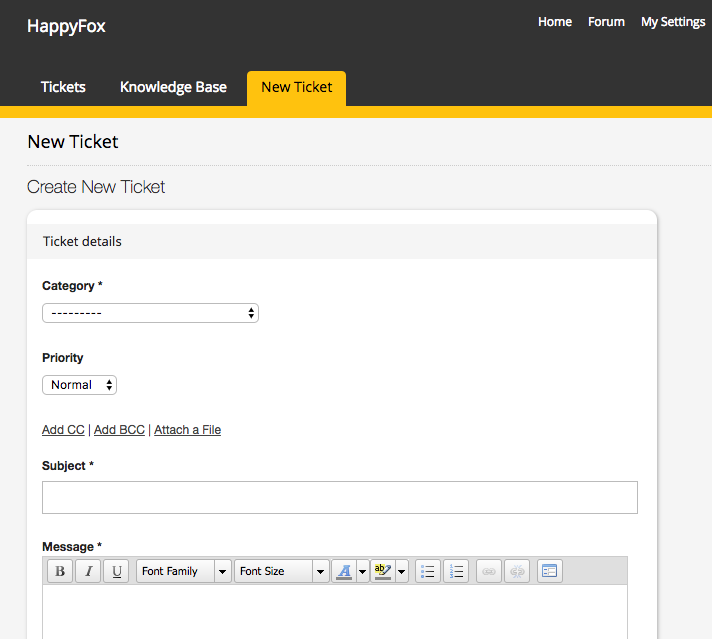 HappyFox lets you customize your ticket form by adding extra fields - contact field and ticket field to collect more informtation about the problem. 5.Click on the Create Ticket button to submit the ticket. 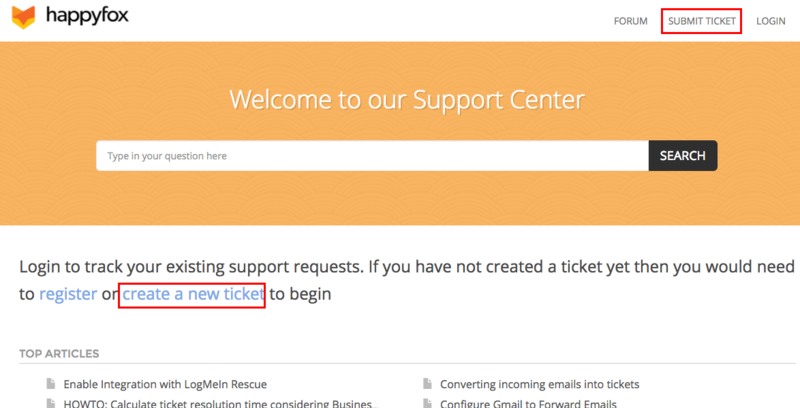 6.The ticket will now be created and can be viewed in the helpdesk ticket list page. 7. An email notification containing the activation URL, is sent out to the customers on their registered email address. Customers can click on it and create a password for their HappyFox account. This can be managed under Manage > Notifications > Contact account invite. The Contact Activation email will also be sent out when the contact raises the ticket for the first time in your helpdesk via any channel. 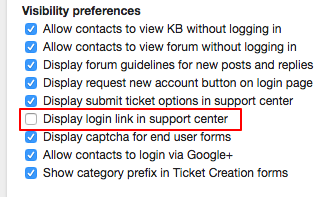 If you don't want to allow the customers to raise a ticket without logging in, you could hide the options under Manage >> General >> Support Centre Settings. Remove the highlighted code snippet from the Contact Home Page Description to remove 'create a new ticket' link. 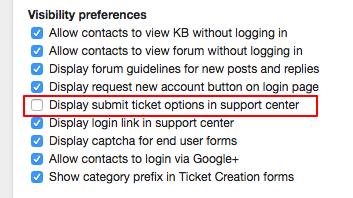 To hide the Submit Ticket option, uncheck Display submit ticket options in support center under Visibility preferences. However, customer should log-in to view and manage the tickets submitted via support portal. 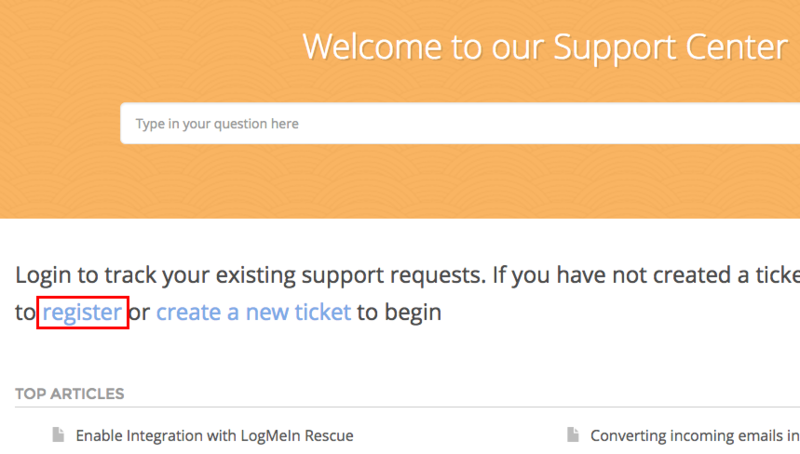 Every person raising a support ticket in your helpdesk through any channel automatically becomes a contact. You can make your customers create an account in your support portal and have them log in before they create a ticket or look at your Knowledge Base and Forums. Alternatively, they can also use single sign on through Google, OneLogin, ActiveDirectory to login. 1. Click on Login at the top right corner of the support portal. 2. Click on New Ticket tab and the ticket form will be displayed. 3. Fill in the details and click on Create ticket to submit the ticket in helpdesk. 4. At any point, the requesters would be able to login and check the status of the tickets they have raised. A new user can create an account by clicking on the Register button on the home page description of the helpdesk. If you would like to restrict your customers from signing up and/or logging into the customer portal, you can modify the settings as required under Manage >> General >> Support Centre Settings. Remove the code from the Contact Home Page Description to remove 'register' link. Uncheck Display login link in the support centre under Visibility preferences to hide the Login option.